Lush Fab Glam Inspired Lifestyle For The Modern Woman: ﻿Supermodel ﻿Naomi Campbell Channels the Iconic Tina Turner for V Magazine! ﻿Supermodel ﻿Naomi Campbell Channels the Iconic Tina Turner for V Magazine! 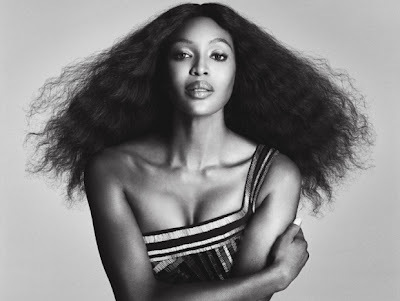 ﻿Supermodel Naomi Campbell Channels the Iconic Tina Turner for V Magazine! Supermodel Naomi Campbell put her trademark model poses on display in the March 2012 issue of V Magazine as she paid tribute to iconic singer Tina Turner. The featured photo-spread paid tribute to Tina Turner's singing career and featured replicas of her signature look, dance moves and unique costumes which accentuated her gorgeous legs. In the V Magazine photo spread by photographers Daniele Duella and Iango Henzi, Naomi is wearing dresses designed by some of the biggest names in fashion including Marc Jacobs, Ralph Lauren, Blumarine, vintage Versace and Calvin Klein. What do you think of V Magazine's Naomi Campbell as Tina Turner photo-spread? Leave a comment below.